Ryan Roxie (born in Sacramento, California) an American guitarist/singer-songwriter currently residing in Stockholm, Sweden. He is the founding member of Roxie 77 and probably most well known for his guitar work with Alice Cooper, Slash, Casablanca plus many more. Along with his writing, recording, and touring schedule, he's hosting 'The Big Rock Show with Ryan Roxie'. Roxie consults for The Gibson guitar company as a Product Specialist/Cinician. 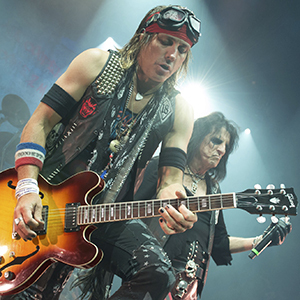 We are very excited to have lessons with Ryan Roxie here at playalongmusic.com!